Shale gas is unconventional gas in locations that require special stimulation and/or production techniques to achieve production. Shale is one of the most common sedimentary rocks in the world and it is primarily composed of clay and fragments of other minerals such as quartz and calcite. Shale can be the source, reservoir and the seal for natural gas. Shale formations normally have low permeability (limited ability for gas or fluids to flow easily through the shale formation) and normally require stimulation techniques (such as fracturing) to economically produce shale gas. Shale gas is natural gas that is attached to, or "adsorbed" onto, organic matter or is contained in thin, porous silt or sand beds interbedded in the shale. The Alberta Energy Regulator (AER), is evaluating the shale gas resource potential of all prospective shale gas formations in Alberta. As many as 15 prospective shale gas formations have been identified, five of these formations (Duvernay, Muskwa, Basal Banff/Exshaw, North Nordegg, and the Wilrich) may contain up 1,291 trillion cubic feet (TcF) of gas-in-place. The Alberta Shale Data report contains estimates of the volumes, more time is required to prove the viability of shale gas. Shale gas can be produced from conventional shallow gas vertical and directional wells. However, due to the low permeability that is characteristic of shale formations, horizontal drilling and stimulation techniques such as multi-stage hydraulic fracturing are often required to achieve economic production. Vertical and directional shale wells are commonly commingled with other production zones to yield higher production. To date the majority of Alberta's production has been achieved using vertical wells along with a few horizontal wells. In recent years, the use of horizontal drilling combined with multi-stage fracturing have resulted in some of the most attractive shale gas formations in North America. Thermogenic shale gas, normally formed during deep burial where heat and pressure cook the organic matter releasing natural gas, is often developed using horizontal drilling and multi-stage hydraulic fracturing. 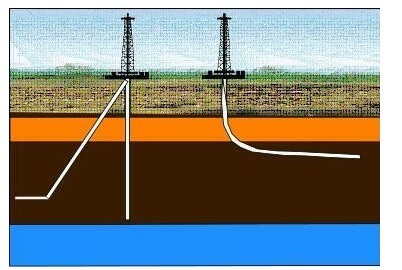 These techniques can be combined with multi-well pad drilling to reduce the number of well sites per section that are needed. The production from one horizontal wellbore with 10 fracture stages may in some cases be equivalent to drilling 10 vertical wells with a single fracture each, spacing and development is regulated by the AER. Setting requirements for drilling and production operations. Protecting our fresh water aquifers (groundwater) with strict regulations that are designed to ensure that gas cannot migrate up a well bore to contaminate groundwater sources. Well bores are required to have cemented casings in place that meet stringent requirements and which are also set to depths far below any fresh water aquifers. This ensures there is an impenetrable barrier between the shale gas formation and the well bore so that gas and fluids are unable to use the well bore as a pathway to contaminate groundwater. Alberta has strict requirements in place to manage the safe disposal of produced fluids (fluids that return to the well head as part of the hydraulic fracturing process) and does not allow produced fluids to be sent to municipal waste water treatment systems. Fluids that cannot be treated and recycled must be disposed of in approved disposal wells where the fluids are injected deep underground for permanent disposal. Shale gas is regulated under the same legislation as conventional natural gas. Alberta has considerable experience with hydraulic fracturing, more than 179,000 wells have been fractured in Alberta since the 1950s. Shale gas is recognized as a valuable resource in Canada and the United States; please see the Primer for Understanding Canadian Shale Gas (PDF, 7.66 MB) and the U.S. Department of Energy: Modern Shale Gas Development in the U.S. (PDF, 8.06 MB) for more information.